This has been on my TBR for awhile, but after finishing The Heir and the Spare, I was inspired to keep going with my royal reading. For the first 100 pages or so, the two stories were almost identical. Strong, sassy American girl goes to college in England. There, she is immediately enveloped into a group of friends that includes the royal heir or spare (heir in this case, spare in case of the Emily Albright book.) Hot royal guy actually turns out to be really down-to-earth and has a great rapport with the girl, and they quickly develop strong feelings for each other. But after that, the similarities end. 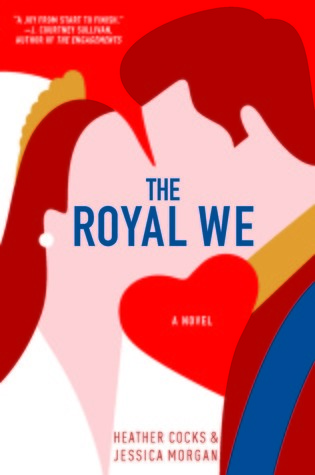 While The Heir and the Spare takes place within a year, The Royal We spans about eight years of the lives of Bex, Nick, and their family and friends. The story starts in present day and then is told in flashbacks, leading up to the closing scene which again takes place in present day. The technique works well here, because the relationships I started reading about in modern day are quite different from where they started. I liked this book because it wasn't a "She met a prince, they fell in love, she married him and became queen, and they both ruled the land happily ever after." Oh no. This is real life, and I love it! It's full of high highs, low lows, betrayals, keeping up appearances, relationship fatigue, family drama, and so many other things that go wrong in a real life love story. Unfortunately, I think it might have been a bit much, as it failed to really keep my attention. I found myself skimming the middle part and then picking back up at the end. If this were to be adapted, it would be a good TV show as opposed to movie. Ultimately, I did enjoy it when I was reading it, but it could have perhaps moved along a bit faster to keep me turning the pages instead of jumping over them. I'm on a roll now! Do you have any other royal recommendations for me? ?